Last night Samsung held the opening keynote for its 2018 Developer Conference in San Francisco, California. 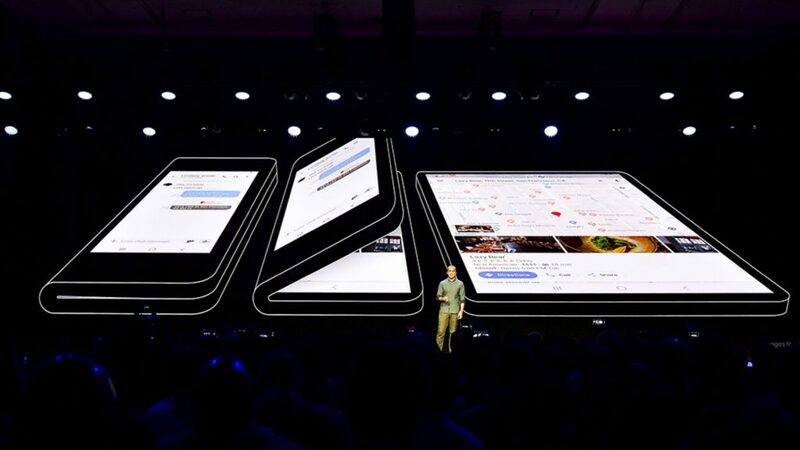 What made this year’s SDC 18 noteworthy was the fact that Samsung was expected to debut a new foldable device to the public for the first time. As expected the South Korean manufacturer waited until the end of the keynote to reveal the device, along with the new display technology used to create it. Samsung is calling the latter Infinity Flex, and are heralding it as a game changing development in the world of mobile displays. While the manner in which Samsung created new polymers for the Infinity Flex is interesting, we were far more taken with the foldable phone, which the company showed off in part. As you can see from the header image above, much of the device was covered up to “mask” certain design elements. 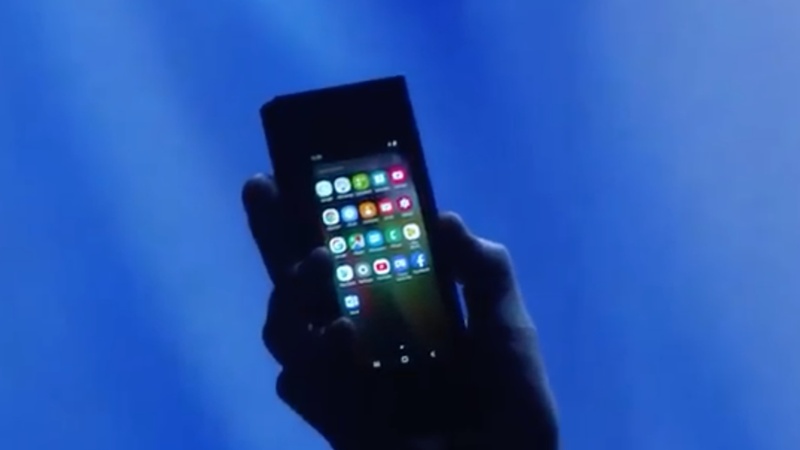 That said we were at least able to see how its folding mechanism works, with two modes on the cards from Samsung. The modes in question are a cover mode and tablet mode, with the former being when the device is folded in half and the latter when it is opened up. From what we could tell during the keynote, the foldable phone will fold fully in half, and not look like a wallet as we’ve seen with the Royole FlexPai earlier this week. A few more details for the device have also emerged, with some of the display specifications confirmed by the company during SDC 18. In particular the display for the device, which we’re calling the Galaxy F until indicated otherwise, will measure 4.58″ (diagonally) in cover mode and 7.3″ in tablet mode. Added to this is a dots per inch of 420 dpi in both modes, as well as a resolution of 1 536 X 2 152 in tablet form. Samsung is also working hard with Google to ensure the foldable phone is fully optimised for the Android ecosystem, with apps said to work seamlessly when transitioning from cover to tablet modes. 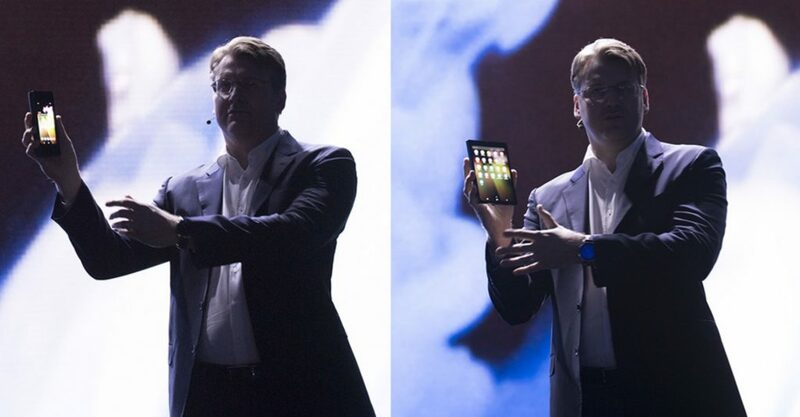 Hopefully the foldable device will also feature a few other tricks up its sleeve, and an S Pen stylus given its size. More information will likely emerge early next year, but Samsung has not mentioned any definitive dates on when it plans to bring the new foldable device to market. How much are you over spending on your cloud solution? Which type of hard drive should you be using?